Are you ready to install a High Functioning & Long Lasting Wastewater system? It’s important to consider the longevity of your design at the beginning and that begins with some simple, but vital, steps that need to be taken. The installation process begins with some basics like evaluating the soil and the surrounding landscape. Soil can differ greatly in terms of texture, structure and density. These factors can all affect how drainage occurs. A soil test is conducted and is an absolutely crucial part successfully managing onsite wastewater. In addition to the composition test, the layout of your site needs to be assessed. Is there enough gravity for the contents to flow from the house to the septic tank or will an effluent pump need to be utilized? From there, does the effluent need to be treated or directly moved to the soil treatment? Again, is a pump necessary or can gravity do the heavy dropping? Each of these answers directly impacts the size of the pump and the design and placement of the pipes to be laid. Installed correctly, along with regular maintenance, a system should last indefinitely. Please contact the experts at Alberta Septic & Excavating for a free quote! Ever wondered what can safely go down the drain? Check out the post on “What NOT to Flush”. 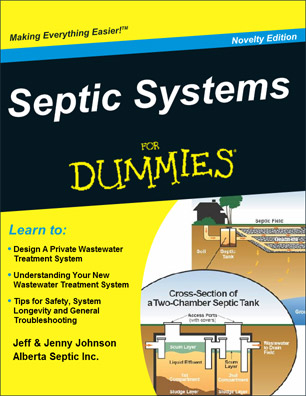 Call Jeff at 403-559-6729, http://ow.ly/5DMo30apFzG if your Septic System needs some TLC this spring. We are booking up fast, so call today! Spring has sprung and it is time for a quick discussion on septic system health. As the saying goes, “An ounce of prevention is worth a pound of cure.” It’s easy to get a little cavalier — or, even lazy?? –about what things go down the drain or get flushed. To prevent a costly repair bill, here is a list of things NOT to flush. These items all clog or burn up the grinder. Cigarette butts are not biodegradable and should not be flushed into the septic system. And the filters on cigarette butts can clog and destroy septic pumps. Condoms won’t clog a pipe but like some other debris, because they are of modest size and are quite flexible, but condoms are (usually) not biodegradable. So we listed condoms, or other latex products such as latex gloves above as “never flush”. If your system uses a septic pump or grinder pump or sewage ejector pump, this material can clog the pump impeller and cause expensive pump damage or motor burnout. Grease waste, cooking fat, lard, etc. Latex condoms, gloves, or similar products – we discuss condoms in septic systems further in the next section of this article. Paper towels and facial tissues (Kleenex™) do not break down easily and should not be flushed into the septic system. Toilet paper breaks down quickly and should not be a problem in an ordinary septic tank system. String or cord – like dental floss above, can clog or bind grinder pump or sewage pump impeller assemblies leading to pump burnout. If you have any questions, or, you (or one of your children!) end up flushing any of this matter down your drain, please contact Alberta Septic & Excavating. Alberta Septic does repairs as well new installs and can offer expert, professional advice. Spring is the ideal time to tackle some of these yucky matters. Call or email today– we are booking up fast! And, remember to like “Alberta Septic & Excavating” on Facebook. Remember to clean your effluent filter in your septic tank.